My first event was in Thescorre. It was College of Three Ravens in 2004. I attended with my twelve-year-old son, Finn (Graham) and I will always remember the kindness of Duke Khalek, Dutchess Bronwyn and THL Magdalena who invited us to sit with them at feast. I am a 13th century Scotswoman fostered out as a child and now married to the Lord of a manor on the coast of Ireland in Clár. Lady Máirghréad works with the Abbess of the nearby foundation to share knowledge including the scribal arts, music and herbal arts and thus improve the lot of her family, household and community. My Scots ancestry and my husband’s Irish ancestry were factors. Our son, Finn, has had an interest in our Celtic heritage since he was a young lad and I have as well. I have been a member of Clan Blackhart – a service household – since 2010. I am protegee to Baroness Gillian Llewelyn of Ravenspur who heads the household. I am apprenticed to Baroness Robert McMoreland. I have been a member of the Barony of Thescorre Scriptorium for 14 years and participated in Cauldron Blue Cooks’ Guild from 2004 – 2014. I have been an ‘honorary’ member of the Shire of Hartstone since 2005. I am a chemical engineer working for a large aerospace company in Rochester, New York. I have three grown children – a daughter and two sons and a daughter-in-law. 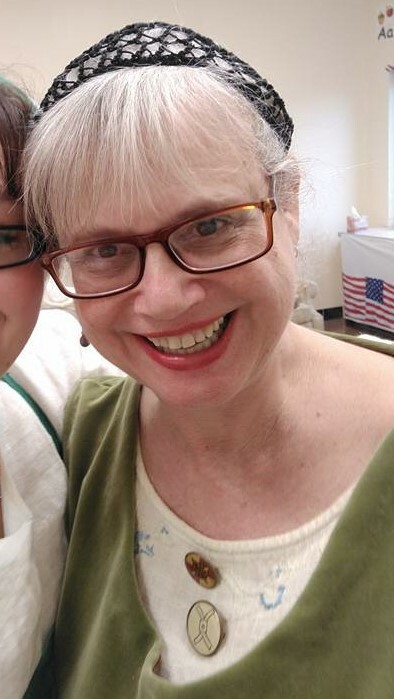 I live with my husband and dog in Irondequoit, New York In my spare time, I am learning how to pilot our 25 ft. boat and salmon fish on Lake Ontario, volunteer for Healing Waters Fly Fishing (veterans), kayak, improve my art works and my gardening – especially herbs. 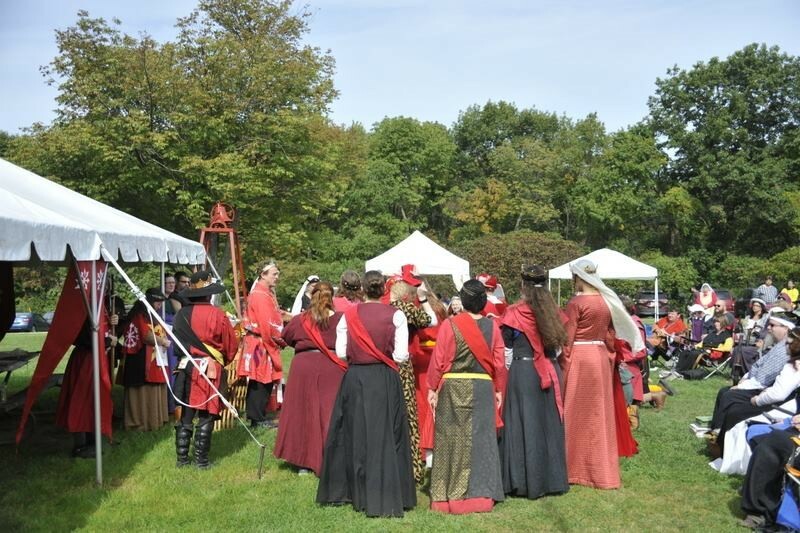 Scribal arts (illumination, wording and calligraphy), music (choir and bardic and musical manuscripts), autocrat, youth boffer marshal, lunch cook and assistant feast cook including an investiture and State Dinner at Pennsic, and herbal arts. I have tried thrown weapons, siege weaponry, bardic arts, brewing and some fiber arts. Retaining for Duke Timothy and Dutchess Gabrielle for the last time during their second reign – I am in the particolored gold and black sideless surcoat. I entered several Ice Dragons and have been a judge at Ice Dragon Pent. 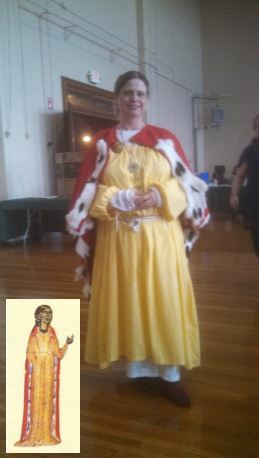 I am very proud that I won Novice Ice Dragon Pentathlon in 2014, placed second in Novice Ice Dragon Pentathlon in 2009 and also represented Duke Timothy and Dutchess Gabrielle and AEthelmearc in the Pennsic Artisan War Point with my period musical manuscript scribal arts project in 2015. I thoroughly enjoyed participating in the Oxhide Bardic event and my husband lent his bearskin rug for us to perform on in lieu of an oxhide! 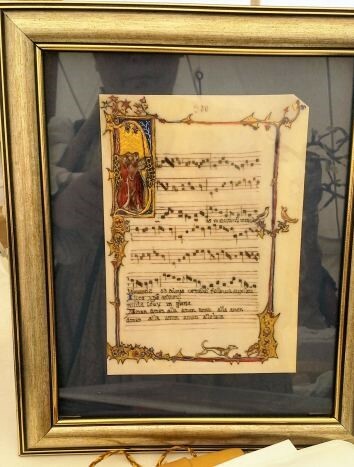 The Pennsic 2015 Artisan Warpoint project I represented AEthelmearc with: a recreation of a musical manuscript from the Montpellier Codex using period materials and tools such as parchment, Cennini gesso, 24 C gold gilding, oak gall ink, and quill pen. Ice Dragon 2014 in the Rhyderrich Hael – I won novice Pentathlon. I created this garb from a painting of Comtesse Beatriz de Dia and performed her tobaritz composition “A Chantar Mer”. I also recreated a musical manuscript of the composition. (Wilkipedia image of the Comtesse in lower left). To have fun…… and support my son in Heavy Boffer Fighting and his historical research….then I got hooked on cooking and scribal arts! 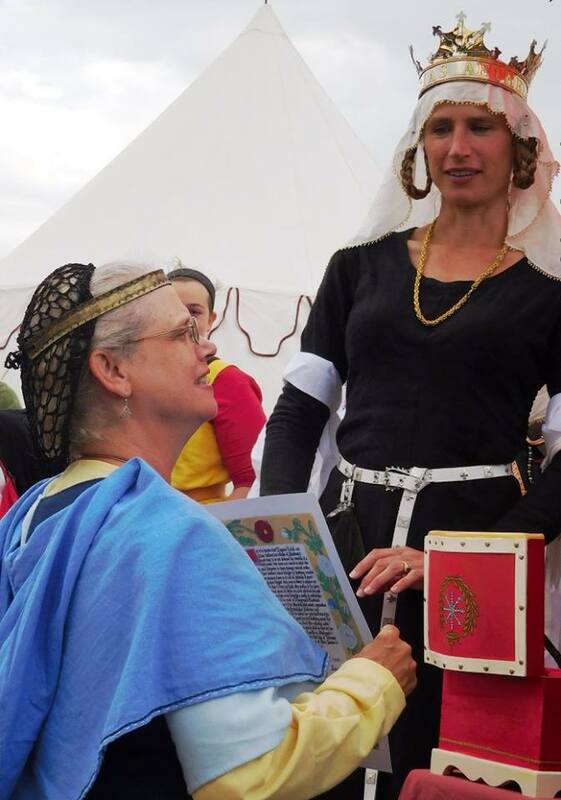 To have fun…..and to continue to serve AEthelmearc and hone my scribal arts skills especially. I will be participating in a parchment making class that I am very excited about thanks to THL Abigail. I want to continue to serve the populace as much as my mundane job and family can allow. It is for this reason that I recently requested and was accepted as both Region 4 and Region 5 A&S Minister (in transition currently). Bring a new member into the SCA who continues to participate actively for a few years at least. The survey that SCA Corporate performed a few years ago made it very clear to me that the SCA will not survive much past the founding generation unless new members are recruited. Mundanely I also am a certified Lean/Six Sigma practitioner (a kind of manufacturing statistics geek) and the statistics that emerged from that survey were quite ominous. Besides, bringing the joy to another that I have experienced in the SCA would triple my joy! My advice would be: Find your tribe. You cannot navigate the SCA alone unless you are a rare giant superstar of talent who bursts upon the scene and is then almost immediately “adopted” – highly unusual. Be polite and ask what something is or what is being done if you do not know. For example, I did not understand the use of the term “event”. For the shy person who has trouble asking questions in crowds, I would suggest they write them down or simply seek out the Chatelaine and talk to them privately. Watch and seek out those whose interests are common to yours and reach out to them. I would ask for them to never forget how awkward and alone they may have felt during their first meetings and/or events and to always seek to ease that burden for those who are new. My last advice would be – be politely direct. If you have an issue with a Scadian, seek them out privately and discuss constructively. I would dearly hope they would be treated likewise. If not, depending on the situation, I would offer to find them counsel to resolve and move forward. To be an excellent seamstress and designer of period garb and accessories – if possible creating the fabric and materials from wool, flax, silk or other primary source!!! I am still recovering from being inducted into the Orders of the Millrind and Fleur d’AEthelmearc and if I never progress above that level, I will be content. However, if I were awarded the Pelican Peerage, I would be confident that my service was both recognized and cherished at the highest and most chivalrous level and I would strive to continue to serve in the spirit of the Order. Likewise, an award of the Order of the Laurel would spur me to more confidently spread and teach the scribal arts and engage with the Laurel community to continue to grow artistically at the highest echelon. Having said that, I must say I would choose to be honored for service over arts and sciences first and foremost. I would like to thank all those Scadians who have welcomed me, mentored me, trusted me to take a project, office or scroll assignment and run with it. For the times I have had to decline invitations to serve or have had to change my plans to serve, I am sorry. I do heed the “Family First” adage. The past three years have been fraught with serious family illnesses including my husband, daughter and sister. Finally, the past fourteen years have expanded the “three little boxes” of my life: work, play and learning in so many rich and wonderful ways they are impossible to count. I have made lifelong friendships and I can only say “Vivat!!!!! Bob Raef!!!!!! In Glorium AEthelmearc!!! !